Kayci Martensen, running for D3 Benton-Scales Mound-Shullsburg competed at the Pioneer meet at UW-Platteville. She won the 800 in a pedestrian 2:29 and anchored the 3rd place 4x800 team in 11:02. I wonder what the other splits were. I don’t know what kind of team BSMS has this year. There were no team scores in the results. Anna Gallagher of Two Rivers won the 3200 at the UW-Oshkosh small school meet in 11:19.45. I misspelled Mukwonago on a personal print order that I did last year - couldn’t believe it! I use the items in CA - nobody knows the error. Brookfield Academy is D2 for track. Tough middle distsance sectional with Shorewood, Wisconsin Lutheran, Port Washington, Grafton. Where does Patrick willis 9:47 indoors rank for freshman all time indoors for Wisconsin? I haven’t seen her. Madison west seemed to have very few athletes who ran even the Madison west relays. Not exactly sure why. Overall despite an amazing indoor season from some of the top boys distance runners, many solid athletes have run 1 or no races so far this year and we are aleady in April, I think outdoors starts next week as I recall racing next week outdoors. It’s possible I just can’t find the results without deep digging as they are small meets etc. Back in the day the indoor season was truly a season and for the most part it’s been de emphasized by many programs which may be due to injuries or science etc not sure. I guess those athletes who haven’t opened still have 2 months which is plenty of time to get in shape for state but 6 weeks is not that long to peak for conference in mid May especially if a few meets/practices are cancelled in April due to Wisconsin weather and for most athletes conference should be the peak unless they have a very good shot at making state. Probably the wrong post but not sure why Wisconsin indoor doesn’t start earlier so kids can train like the rest of the nation a bit earlier with their coach which is probably more relevant in the shorter distances and field events than the 2 mile. Obviously it will conflict with basketball for some but not that many. With all these national and regional meets that kids can run indoors if they travel that didn’t exist back in the day overall I think the status quo is fine as athletes can choose on their own how serious they want their track and indoor track season specifically to be at least on the individual events. Ok back to making this a highlight for great freshman performances. 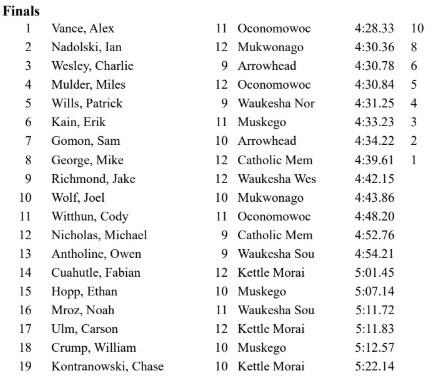 As an aside kettle moraine had a boy open up a few weeks back in 2:06s so that is a potential sub 2 flat freshman in the making. Will give him more attention vs being at the back of an irrelevant post if he shows another solid effort. Definitely up there. Perkins ran 9:23-24 at Nelson Daniels but wasnt a “true” freshman. Charlie Wesley beat Wills in the 1600 at Classic Eight Indoor. 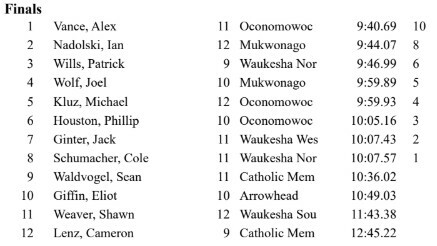 Separately oconomowoc has 4 fine distance runners in those 2 races. Not sure what track that was.